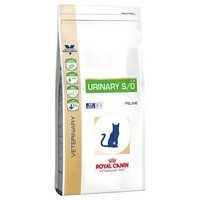 Royal Canin Urinary S/O Dry Food for Cats is a complete and balanced veterinary diet for cats that has been specially designed to treat kidney stones and bladder problems. Made with a carefully formulated recipe to help with the dissolution of struvite uroliths, Royal Canin Urinary Vet Diet also helps to reduce the risk of recurrent struvite and calcium oxalate urolithiasis. after advice from 'Uncle Ben', our vet, we put George on Royal Canin Urinary Tract LP34 in an attempt to cure this pernicious complaint. George has never looked back and now lives the carefree life he should. Again my Joey loves Royal Canin food. he had a urine infection hence buying and seems not to have any issues. ie pain when going to the toilet. So hopefully this helped. My cat gets on well with this diet, no problems. Very palatable and my other cat (who doesn't need these biscuits) tries to steal them! I have been using Royal Canin Urinary Feline Dry LP34 to feed my Persian who has reached the grand old age of 20 and is still going strong. She has been on this diet for approximately 15 years since being recommended to me by my vet. I think her great age and continuing good health is due to her diet. I started using this for one cat who had crystals then when a second got cystitus due to stress at a cattery I now feed them both with it. To say they love it would be an understatement. They both find it easy to eat and enjoy it. We use this food a lot in the cattery as we always seem to have at least one boarder who is prone to cystitus/urinary crystals. Sometimes we just add a small portion to the biscuits of cats who aren't drinking enough and it works! The only problem is that it seems to be a little bit on the heavy side where calories are concerned! For very fat cats we tend to use Hills C/D.